Chevrolet Europe is gearing up to take on the fastest high performance sports cars in Europe with the new Chevrolet Corvette Stingray. They will be introducing the all-new global 2014 Chevrolet Corvette C7 in European dealerships in late 2013. Chevrolet Europe is doing some extensive European road testing right now and just made the logbook experience live for fans. Performance fans all over Europe may be seeing the new seventh-generation Corvette on the roads as Chevrolet’s technical experts put two pilot vehicles through their paces over the next couple of months. Chevrolet knows they need to appeal to a global audience as the Boomer generation in the U.S. who have been purchasing the American sports car are getting older. Can the new Corvette compete globally? Starting today, performance car fans in Germany, Switzerland, France and the Netherlands will see the first new 2014 Corvette hit the roads as Patrick Herrmann, technical manager at Chevrolet Europe conducts the tests and documents his experiences. He will be the first to thoroughly test the new Stingray in Europe, which will arrive at European dealerships in late 2013 and begin to compete with the fastest supercars in the world. Chevrolet designed the new Corvette to have global appeal and is the most powerful Corvette ever. For the first time in its history, the newly designed Corvette had input from designers outside the U.S. GM International Operations Vice President of Design Bryan Nesbitt says,“Things move very, very quickly and the industry is competitive.” But can the new global Corvette compete with Europe’s fastest supercars? Herrmann who will be testing the new American sports car thinks Chevrolet has a good chance. "Corvette is a one of the famed names in automotive history and the new Stingray is the most advanced and capable standard model yet.” Hermann will be documenting his experiences over the next two month’s before GM launches the high performance sports car in Europe. Fans can check out his progress on Facebook, Twitter and Instagram where he will will be uploading his observations as well as images and videos. Chevrolet launches the all new 2014 Corvette Stingray in Europe and will go on sale in September 2013. Would you choose one over a Ferrari? 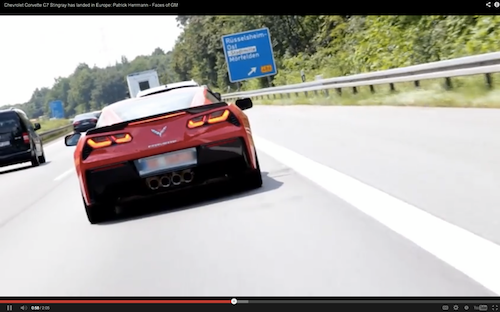 Watch Corvette Stingray Autoshow Walkaround video.